Well, I was on the phone and after she said that I started to talk to her. She either lied or when you read my question or statement, did NOT respond. At that point I would move on to the next question/fact, until I finally said “thanks for listening” and hung up. She is the person who sat in on the murderer’s Grand Jury hearing and allowed the lies, defamation of character of Sam and other witnesses, and mostly irrelevant information which should never have been allowed in the court room. The case was originally out of the Cumberland County, Me. District Attorney Anderson’s office, with all her crew of lying Asst. DA’s, but due to DA knowing they couldn’t win against us, she moved it to the Atty General’s office, which couldn’t win it either UNTIL initial Portland Police Dept’s report, which was EXCELLENT, and said “probable cause for at least elevated aggravated assault charges against Fred Dodge, was TRASHED, and Sam, for first time, became a defendant, with Fred of “criminal threatening with a dangerous weapon” and “reckless conduct with a dangerous weapon”. Both are FELONY charges. Sam had up until that time in ALL affidavits, etc. been considered “victim”. He did nothing except sit in his chair on the porch, with a gun, not even pointing it at Fred who had trespassed on his porch, attacked him, and ultimately shot him through femoral artery. And then left Sam, in a pool of blood, to bleed out. Please read the May 10, 2017 letter I sent, in my son, Sam’s stead, to Cumberland County, Maine District. Attorney Stephanie Anderson, regarding the case related to mishandling (malicious prosecution) of the Frederick Otis Dodge attempted murder of my son, Samuel Thomson Iserbyt. *(Letter is at very bottom of this email). Before I get started, let me bring to your attention (below) what we consider KEY to acceptance of our account of the Fred Dodge murder attempt, which are in addition to all the Witness Statements that incriminate Fred Dodge, and in any reasonable person’s judgment, prove without a doubt that Fred Dodge planned and carried out the murderous attack non Sam Iserbyt last Memorial Day, May 30, 2016. The eye witness, Alyssa Conley, in her call to 911,gave an account of the incident as it took place (in real time). Other witnesses stated that they saw Dodge coming down Chadwick Street, brandishing a gun, threatening, with foul language, to murder Sam, and when he arrived at Sam’s porch steps, taking out his gun and pointing it at him. Why were none of these witnesses called to testify at either Sam’s or Fred’s grand jury hearings? Why were the two policemen, first at scene of the crime, Sgts. Goodale and Bennis not called to testify at either Sam’s or Fred’s grand jury hearings? It was Sgt. Bennis who questioned Sam regarding “who shot you” and got following response from Sam: “Fred Dodge”. Yes, the jury was “perhaps” given or read parts of their statements (we do not know for certain), but were jury members given copies of their statements? Since neither Goodale nor Bennis were present in the courtroom jury members were unable to ask questions of them. ( ) honest statement followed her decision taken four months (?) earlier (July 15, 2016) NOT to prosecute Fred Dodge since she, for the state, could not get a unanimous jury. Reason: the state did not have enough evidence to prosecute. The ADA’s initial statement (above) that the state did not have enough evidence to prosecute flew in the face of the numerous witness (including eye witness) statements given to the Portland Police Dept. the night of the incident. Sgt. Det. Dean Goodale, who was Superintendent of the Investigation and subsequently in charge of the Police Report,, told me, a couple of days after the incident, that there were quite a few people mingling on street that night since weather was beautiful and that he had the opportunity to talk to them and they all corroborated Sam’s story regarding what had happened. This corroboration was followed up by signed witness statements attached to the PPD Report. Assistant Attorney General Lisa Marchese told me (Charlotte) on the phone May 24, 2017 at 5:00 PM that there was no evidence to be tested!!! 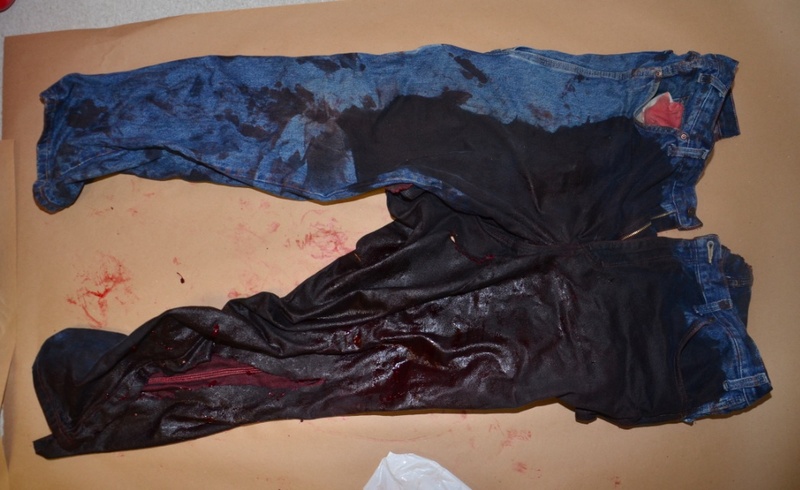 (See image below of Sam’s blood drenched jeans which were also not tested). A cracked cell phone was also NOT tested. Most important of all is fact Sam’s gun (one Fred used to shoot Sam) was NEVER tested!!! Was it legal for the WENA to publish on its website Fred Dodge’s version of the incident, i.e., that Sam, an accomplished Marine Corps rifleman and combat veteran, had shot himself in the leg one week (+) BEFORE the Portland Police Dept. had completed its official report which DID NOT STATE that Sam had shot himself in the leg? PPD Report implicated Dodge in what it considered elevated/aggravated assault with a deadly weapon. Transcript of Fred Dodge testimony at Grand Jury hearing in early December 2016 contains 50+ pages of foul language, irrelevant, lying testimony, defamation of Sam’s character, as well defamation of character of other witnesses, etc. ADA Sahrbeck refrained from stopping Fred,other than a very few times. Dodge’s lying testimony should have been thrown out due to its total irrelevance to what lead up to, and what actually happened Memorial Day May 30, 2016. Sam’s testimony, on the other hand, at his Grand Jury hearing, taken one month earlier, was in stark contrast to Fred’s testimony. Sam told the truth and nothing but the truth since he, the injured, had absolutely nothing to hide, having committed no crime whatsoever. Detective Dunham, who interrogated Fred Dodge the night of Dodge attack on Sam, vociferously charged Fred with lying several times during the interview. He also, for some very, very bizarre reason, told Fred “not to lose any sleep over this!” Dunham also, interestingly enough, retired several weeks after the incident. EMS was not notified until 8:55 PM, 22 minutes after Sam gunshot wound through the femoral artery. Police Dept. Dispatch Protocol across the nation calls for IMMEDIATE EMS response to gun shot wounds. Who, exactly, was responsible for the delay which resulted in Sam being one minute from death? Had Sam not lived three houses (one half a block) from hospital, he would have been dead on arrival. My son, Samuel Iserbyt, and I, have been involved in trying to get the truth Out regarding two murder attempts on Sam between November 2015 and Memorial Day, May 30, 2016. The first plan to murder Sam is known as the “pop in the head” incident in November 2015. The police audio tape provided Sam, by mistake, in District Attorney Discovery materials, is included as Attachment #1 to this email. Listen carefully… First comment by Patrolman Hurley “If he had moved I would have popped him in the head… that was my plan” is followed up by another most curious statement by Patrolman Ryder “This is not FEDERAL anymore”. Also included is comment “Graham (Hults) and the Chief are on the phone. Sam was successful, without an attorney, in getting Asst. District Attorney Jennifer Ackerman to dismiss “cooked up” charges related to Sam’s curious October 2015 misdemeanor charge which resulted in above”pop in the head” incident and audiotape. Matt Byrne, one of your journalists, covered the most recent May 30, 2016 (Memorial Day) incident. We have had nothing but cooperation from Matt related to this recent incident. We have recently been in touch with Ed Murphy, who has been equally cooperative. Both of you (top PPH and BDN editors) have undoubtedly been advised regarding our wish to have The Portland Press Herald and the Bangor Daily News do extensive, truthful coverage of the most recent 2016 Memorial Day tragic incident which will affect negatively the rest of my son’s life and what is left of mine, as well. Up front, Sam and I want both of you to know we have the highest regard and respect for several Portland Police Dept. officers and detectives who were present at the crime scene the night of the attempted murder incident and who were in charge of the official PPD Report. What has bothered us for many months is District Attorney Anderson’s malicious prosecution of the case: her trashing of the original excellent PPD Report which included Alyssa Conley’s eye witness recorded statement, as well as other witness statements, all of which related To and corroborated my son’s version of Fred Dodge’s pre-planned attempt to murder him on May 30, 2016. This email is quite urgent since Sam and I have waited many months for the truth to be told, truth which affects not only Sam and me, his mother, and all his family, but all the citizens of the City of Portland, Maine and of the United States of America. Why? Because Sam, from the time of the shooting and throughout the past year, has had all relevant constitutional rights denied him, including American citizens’ right to defend themselves and their property with a firearm. Frederick Otis Dodge is fortunate indeed that Sam did not react by shooting him. Sam just remained sitting in a chair on his porch, warned Fred with a laser dot (the use of the laser dot, according to national police journals, prevents eight out of 10 incidents). Fred ignored the warning, walked up the porch stairs grabbed Sam’s gun from him, pressed into Sam’s femoral artery and pulled the trigger. Witness statements attest to the fact that they saw Dodge walked up the street, threatening with foul language to murder Sam. Dodge, who attempted to murder my son, was not arrested, nor charged with any crime the evening of May 30, 2016, even though Det. Dunham objected several times to Dodge’s lies during interrogation at PPD headquarters. Hearing testimony, taken last November, 2016, includes not only irrelevant statements and defamation of Sam’s character,but many outright lies. 1. Why was Fred Dodge not arrested, charged and thrown in jail the night of May 30, 2016? 2. Was it legal for DA Anderson to trash the original Portland Police Department’s excellent Report of the incident and to accept Fred Dodge’s lying version of the incident included in his Grand Jury Testimony? Dodge was the only person who could have been involved in the elevated aggravated assault, which caused Sam to be close to death upon arrival at the hospital. District Attorney Anderson’s malicious prosecution, due to her anger over Sam’s delivery of a Tort Claim against the entire City of Portland, post Dodge attempt on his life, resulted in the quite “clever” steered Grand Jury indictment of Fred and Sam on two identical felony charges. Sam had, up until Anderson’s reframing of the charges, been considered by PPD as “victim”. Sam’s lawyer, who knew Sam did not want to accept such a dismissal, cooperated with Sam’s prosecutor, Asst. Attorney General Robert (Bud) Ellis in the crafting of the deal since Ellis knew full well he could never go to upcoming jury trial and get a unanimous jury, since Sam would have for the first time been able to get all witness statements,photos of bloody wound and clothes, broken cell phone, gun etc. before the Jury and Judge. It is obvious to any fair-minded person that much injustice has been dealt to not only Sam and me, but to persons in the Portland Police Dept. who know exactly what happened 2016 Memorial Day. Two attempted murders of an innocent taxpaying property owner citizen within eight months is not something citizens of Portland will accept easily. Could be the citizens, if informed of the above truthful account, might demand a thorough house cleaning of the City of Portland, from top to bottom? Why should they wait until the following well known saying becomes more and more the case in the wonderful city of Portland, Maine? Please respond to this email or call either Sam or me: 207-522-8150 and 207-807-2107. It is our opinion that only a face-to-face meeting with both of us, preferably at Sam’s house, scene of crime, will allow you to understand the depth of the story, to understand that my son, a U.S. Marine with active combat duty in Gulf War I, a taxpaying home owner in the City of Portland, was the innocent victim of two attempted murders over a period of six months, both of which have been criminally swept under the rug by the District Attorney’s office. As the mother of Sam Iserbyt, I request you seriously rethink the injustice your office has rendered to not just my son and the Portland Police Department (the trashing of the excellent PPD Report related to my son’s attempted murder by Frederick Otis Dodge on Memorial Day, 2016) but to all citizens of Portland, Maine, who could themselves be victimized by Fred Dodge, who was never charged with crime, and who now, one year later, due to prosecutorial misconduct resulting in a steered jury hearing, continues free to walk the streets of Portland, with a firearm. How would you feel, as an 86-year old mother, receiving a phone call at 12:30 AM, Tuesday, May 31, 2016 from a neurosurgeon, telling you that your son had been shot through the femoral artery, survived surgery, and is in intensive care at Maine Medical? You may recall my email to Lts. Beaumont and Sweatt, sent shortly after the incident, in which I requested a meeting with you and others to discuss what I at that time considered the mishandling by your office of the attempted murder of my son by Fred Dodge. Not receiving a response from you or anyone else in your office naturally resulted in a healthy dose of skepticism on my part regarding the handling of the incident. Having, from the with the fallout very beginning, been involved in Sam’s case, attempting to deal (medical, psychological, and legal) of two very serious murder attempts and subsequent cover-ups, I feel compelled to offer to you Sam’s solution to the above-stated injustice: Sam is willing to drop the planned TORT claim against the City of Portland if you will very simply reconsider your office questionable activity related to the handling of the incident May 30, 2016, and prosecute Fred Dodge for Elevated Aggravated Assault in violation of 17-A M.R.S.A. Sam asks that your office prosecute language in the PPD Report: Affidavit: I, Detective Detective Kelly Gorham, duly sworn law enforcement officer for the Portland Police Department, hereby state under oath and upon penalties and pains of perjury that there is probable cause to believe that.. All of which constitute evidence of the crimes of Elevated Aggravated Assault in violation of 17-A M.R.S.A. 208-B. The following action by your office would be a good starting point: Resurrect the original excellent 2016 Portland Police Department Report which included (1) eye witness statement from Alyssa Conley, (the 911 caller) who saw the potentially deadly confrontation and my son’s dropping to the deck; (2) statement from Sgt. Michael Bennis, who, thank God, took it upon himself to apply a tourniquet to stop bleeding, elicited from Sam fact that Fred Dodge shot him; as well as (3) statements from many other witnesses who documented, in detail, Dodge’s coming down a weapon and threatening to murder Sam. The aforementioned witness statements are all you ever needed to put Dodge in jail the night of the incident. Amendment IV: The right of the people to be secure in their persons, houses, papers, and effects, against unreasonable searches and seizures, shall not be violated, and no Warrants shall issue, but upon orbably cause, supported by Oath or affirmation, and particularly describing the place to be searched, and the persons or things to be seized. Amendment VI: In all criminal prosecutions, the accused shall enjoy the right to a speedy and public trial, by an impartial jury of the State and district wherein the crime shall have been committed, which district shall have been previously ascertained by law, and to be informed of the nature and cause of the accusation; to be confronted with the witnesses against him, to have compulsory process for obtaining witnesses in his favor, and to have the Assistance of Counsel for his defense. Amendment VIII: Excessive bail shall not be requried, nor excessive fines imposed, nor cruel and unusual punishments inflicted. Amendment XIV: Section 1. All persons or naturalized in the United States, and subject to the jurisdiction thereof, are citizens of the United States and of the State wherein they reside. No State shall make or enforce any law which shall abridge the privileges or the immunities of citizens of the United States; nor shall any State deprive any person of life, liberty, or property, without due process of law; not deny to any person within its jurisdiction the equal protection of the laws. Sam had the right to own and use a gun to defend himself and his property. Also, as you know, and of utmost importance, Sam did NOT react to Fred threats, his trespass on Sam’s property with a gun, by shooting Fred Dodge. Sam didn’t even get out of his chair!!! Sam intends to pursue justice not just for himself, but for the taxpayers/citizens of Portland, and for his country. As you know, he has served his country, in combat, as an active duty U.S. Marine during Gulf War I. (Sam saved over twenty lives of U.S. Marine Corps compatriots in a special operations mission.) How ironic can it be that Sam survived intense combat in that war, only to come home to find himself under attack (two murderous attempts over a period of 6 months… one on PPD audio) in Portland, Maine, where he is a homeowner and taxpayer, and where he has committed no crime whatsoever? Please respond to this letter. Thank you in advance. P.S. As you know, this whole saga started when Sam called Police Chief Michael Sauschuck Sam’s concerns over Police Officer Safety issues. P.P.S., Please send me Attorney Janet Mills direct, not website, email address. Thanks. Following text added after email sent to D.A. Anderson. It is for the use of interested citizens who may wish to help in publicizing this story. Please pass this on to Maine Senator Angus King and Maine Governor Paul LePage, both of whom may not be aware of the case, but whose offices were informed several months ago. Neither Sam nor I have received any communication (reaction/response) to the information in this email.